The Pioneer 3 - 3 wheel scooter offers superior maneuverability and performance with many extra features! The Pioneer 3 offers excellent indoor maneuverability, as well as heavy duty outdoor performance. 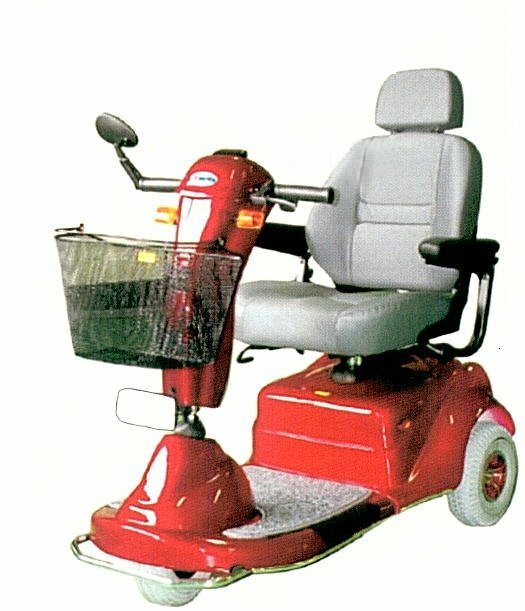 Standard features include swivel seat, head light, front safety bumper and rear anti-tip wheels, ABS body and padded adjustable flip-up arms. Large contoured captains chair with head rest is also standard. The 350 lb. weight capacity offers a break through in mid sized 3 wheel scooters at an economic price! Weight w/o batteries 129 lbs.